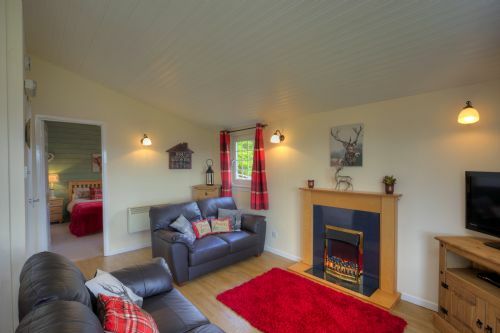 Single storey detached lodge with uninterrupted loch views and decked area. Bathroom with overhead shower and W.C.
* Wi-fi access Full secure access is always available in the Games Hut/ Reception area. Yet again a fab stay in a beautiful location. Everything you could ask for. The lodge is beautifully decorated, well equipped and very comfortable. The grounds are lovely and the location is excellent. Couldn’t ask for more. We had a fantastic stay in Ash Tree lodge. The site is in a great location with lovely walks and a super outdoor area in which the children could play. Being so close to the Creagan Inn was another advantage. The lodge itself was very clean and comfortable with a beautiful view of the loch. Jim and Julie the hosts were amazing and so very helpful. We unfortunately had a car crash in Ardnamurchan and were 3 days without a car. Jim and Julie helped us out so much by ferrying us to Port Appin and taking us to the local shop for supplies. This was over and above what many people would do and we really really appreciated their kindness. Despite our traumas we had a lovely break at a fantastic place! Thoroughly enjoyed our stay. All the facilities needed for a short break are available in the lodge with comfortable beds and great views. We look forward to future visits. A spur of the moment booking. Can't be beaten for scenic value, friendly staff and a great pub within a stone throw. Handy for Oban, Fort William, Glen Coe and a wee trip to Lismore. a great location very clean this was our first visit but wont be our last. as we had a wheel chair user with us it was perfect easy for the wheel chair as the entrance was all on same level. the location is great for oban and fort willam and other lovely places to visit. Everything was spotlessly clean when we arrived. 2 adults and 2 teenage children. The lodge was comfortable with 2 x 2 seat couches, TV and DVD player. No wifi in the lodges but we knew that before we arrived. Cutlery and crockery enough for us but there were no tea plates. No bath mat for the bathroom floor making the floor slippery when exiting the bash/shower. We could have used something to keep our toothbrushes in but we moved a tumbler into the bathroom for that. Being a front lodge there was a lot of road noise during early morning week days as this is the main road from Ft William to Oban, the management grew a hedge which dulled the noise down a bit. Beautiful part of Scotland with easy access to the area. Great with bikes as on Cycle route 78 Oban to Fort William so very safe family cycling. Small site so very quiet but space outside for children to play safely. This was the ideal location and the property was perfect the only thing I would say is the beds need updating a little as the are not very comfy and very squeaky to the extent that even rolling over would wake us up. But apart from that it was brilliant!!! Great location, fabulous Lodge beautifully furnished and Jim and Julie were very welcoming and helpful. Very comfortable accommodation and lovely location. Good facilities and comfortable beds. If only we had the weather! Fabulous place to stay. Ideally situated on the main road from Oban to Fort William so really easy to get around. Fantastic views of the loch and a beautifully maintained site. Always a warm welcome from Jim and Julie who go that extra mile to make your stay enjoyable. The lodges are beautifully decorated and well maintained. Just had a fab week there. Can't wait to return. We have been going to Appin Holiday Homes for many years. We go every New Year and find it an ideal place to relax, enjoy stunning scenery and a brilliant way to "re-charge your batteries". Can't wait till next year!! Lovely location. Lots to see and do in the area. Everyone is friendly. Local shops are economical.local pub with beautiful views within walking distance. The Ash tree lodge was clean and tidy and equipped us with everything required for a perfect holiday. Only gripe was the beds were a bit hard for us. Otherwise everything was perfect. A beautiful location and great views. A beautiful location and great views. Hosts friendly ,helpful and willing to share their local knowlegde making recommendations on local walks and things to see and do. Lovely homely accommodation, well equipped for all our self catering needs. Good Internet access in games room or just outside - a great holiday thank you. Beautiful setting, views to die for and grounds very well looked after. Lodge was relatively small but very well furnished, comfortable and homely. Décor much better than expected given that the website describes only top row lodges as recently refurbished. Was expecting ours to be a bit tired and dated but it was really lovely. Balcony/deck too small for table and chairs for all of us which was a shame but not a deal breaker at all. Family owned and very personal, good local information in lodge, lots to do in area and nice places to eat. We had a fantastic 3 nights and could easily have stayed for longer - next time we'll go for a week! Thank you for your lovely comments re Ash Tree which was refurbished over the winter. Glad to hear you liked it and we look forward to welcoming you back at some point. We stayed here for 4 nights recently. An excellent location to explore Oban and surrounding areas. On site management very friendly and helpful. Beautiful scenery and pub within walking distance. A beautiful location overlooking Loch Crerran. We visited Oban where we dined al fresco on local seafood and took a boat trip to see the seals off Kerrera. We went north to Fort William and the Nevis Range where we took a fantastic ride on the cable cars 2,000 feet up Aonach Mor with superbe views including Ben Nevis. Evenings spent sat on the sheltered verandah or at the impressive Creggan Inn only a short stroll away down the new cycle track. We'll be back !